In the days after the cataclysmic tsunami of 2004, as the full scale of the destruction and horror wreaked upon the islands of the Indian Ocean became apparent, the fate of the tribal peoples of the Andaman Islands remained a mystery. It seemed inconceivable, above all, that the Sentinelese islanders could have survived, living as they did on a remote island directly in the tsunami’s path. The photo that told the world the Sentinelese had survived the 2004 tsunami. Yet when a helicopter flew low over the island, a Sentinelese man rushed out on to the beach, aiming his arrow at the pilot in a gesture that clearly said, ‘We don’t want you here’. Alone of the tens of millions of people affected by the disaster, the Sentinelese needed no help from anyone. Perhaps no people on Earth remain more genuinely isolated than the Sentinelese. They are thought to be directly descended from the first human populations to emerge from Africa, and have probably lived in the Andaman Islands for up to 60,000 years. The fact that their language is so different even from other Andaman islanders suggests that they have had little contact with other people for thousands of years. This does not mean, however, that they live just as they did 60,000 years ago. Commonly described, for instance, as belonging to the ‘Stone Age’, they do in fact make tools and weapons from metal, which they recover from ships wrecked on the island’s reefs. The Sentinelese are believed to have lived on their island home for 60,000 years. 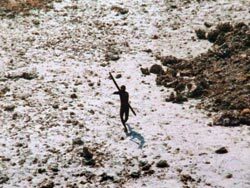 Like so many isolated tribal people with a fearsome reputation, the Sentinelese are often inaccurately described as ‘savage’ or ‘backward’. Their hostility to outsiders, though, is easily understandable, for the outside world has brought them little but violence and contempt. The Sentinelese enjoy excellent health, unlike those Andamans tribes whose lands have been destroyed. 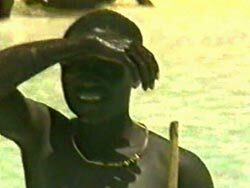 How far this is from the truth can be easily judged from a video of the Sentinelese on the island’s beach taken during an Indian government ‘contact’ expedition in the 1990s. 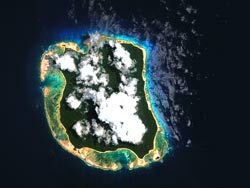 Pressure from Survival and other organisations has led the Indian government to alter its policy towards the Sentinelese, from attempting to make contact, to recognising that similar policies have proved disastrous for other Andaman tribes, and accepting that they have the right to decide for themselves how they wish to live. Underpinning this shift is the simple acknowledgment that the people themselves are best placed to decide what is in their own interests.